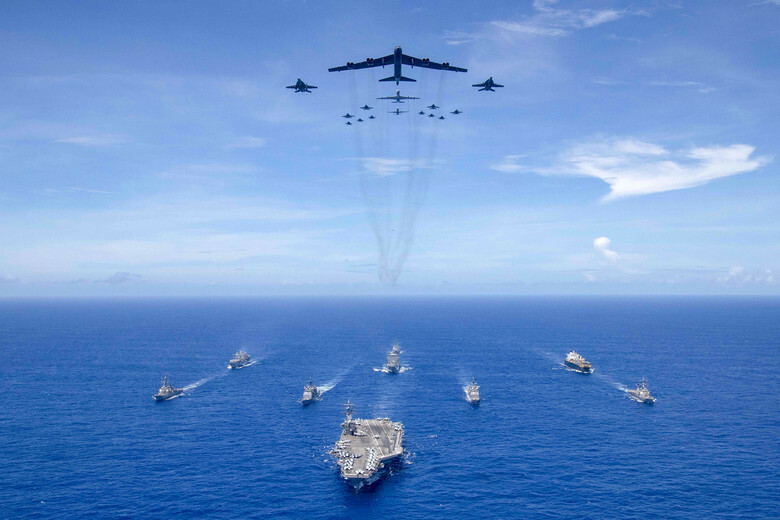 daily timewaster: The aircraft carrier USS Ronald Reagan (CVN 76) leads a formation of Carrier Strike Group (CSG) 5 ships as Air Force B-52 Stratofortress aircraft and Navy F/A-18 Hornets pass overhead for a photo exercise during Valiant Shield 2018. The aircraft carrier USS Ronald Reagan (CVN 76) leads a formation of Carrier Strike Group (CSG) 5 ships as Air Force B-52 Stratofortress aircraft and Navy F/A-18 Hornets pass overhead for a photo exercise during Valiant Shield 2018. I can't imagine their angst when it was discovered just how well the E-3 AWACS radar and sigint systems worked in an open ocean environment. I often wondered at the lack of willingness on all sides to do team building. so many of the different services assets and skills compliment one another that I find the parochial attitude of the different services to be depressing. Thank God it's just you.